Designed to make your life easier. zenon is a software platform that makes the engineering and automated operation of manufacturing and infrastructure equipment incredibly easy. Whether working in manufacturing or in the energy industry, zenon can help you reach and sustain your operational goals. zenon ensures that equipment runs reliably, flexibly and efficiently. Decision makers, engineers and operators in manufacturing companies and energy distribution are able to connect all relevant areas using this comprehensive software platform, from project creation through maintenance. This results in a notable increase in overall equipment effectiveness. Using zenon, all users – from production through to management – can create synergies and make a sustainable impact on business in a measurable and positive way. The zenon software platform provides one integrated environment that combines data recording, machine operation, and business intelligence. This helps businesses to maintain a competitive edge throughout the digital transformation. Do you want to evaluate and gain insights into existing data? One of the greatest challenges of data overload is in evaluating the obtained information and drawing the correct conclusions from it. zenon generates both simple calculations and comprehensive key performance indicators, in real time or based on stored data. Do you want to map and operate complex systems and processes intuitively? zenon reduces complexity for operators, leading to well-founded decisions. The software platform visualizes wide-ranging processes in real time to give operators control over the equipment, from an individual machine, and a production location, to the entire business. Do you want to contextualize extensive process data? zenon makes linking and comparing data simple for entire operations. The software platform displays all relevant information at a glance, even across equipment and locations. Do you want to get detailed information about your production operations and equipment? Operational data is often not stored centrally, leaving the potential for process optimization untapped. zenon systematically collects, processes, and transfers data to other systems when necessary. Heterogeneous hardware landscapes can be easily connected and expanded. This is made possible by numerous drivers and open interfaces. Do you want to engineer automation solutions quickly, easily and accurately? No programming skills are required to create projects, including multi-location projects or those requiring redundancy. Projects are configured by setting parameters, supported by configurable wizards. This even applies to the maintenance and extension of existing applications, regardless of the software version originally used. The zenon software platform offers a strong engineering environment which allows the creation of applications without the need for programming skills. It also allows maintenance to be carried out during the whole industrial product lifecycle. In addition, zenon supports extensive automation of engineering tasks. Connect all existing industrial devices, such as PLCs, by reading and writing using the zenon software platform communication stack. In addition, zenon offers industrial protocols, such as OPC UA. While acquiring data you can validate on the fly, aggregate and pre-process data in a logical way. Both machine-generated data and manual input can be archived together and processed for later use. The data can be correctly structured, aggregated and contextualized already while being stored. It can also be transferred to linked systems via Gateway. The zenon software platform offers comprehensive options to model and contextualize data across plants and production facilities. Also included: equipment modeling according to ISA-95 as well as extensive options to define and use meta data (e.g. batches, shifts, alarm classes and causes of error). Meta data is consistently available in all platform capabilities. Humans are an integral factor in digitalization. The zenon platform supports them in their actions and decisions. zenon visualizes complex systems and processes clearly, which supports sound decision-making. Intuitive intervention and corrections to existing systems can be done easily. The zenon platform allows you to monitor and control machines and plants. Extensive integrated control mechanisms facilitate correct operation and avoid errors. Depending on the requirement, operation can be administered directly at the machine or remotely. Control happens manually or automatically, by using rules and sequences. An integrated workflow engine guides users through defined workflows, either pre-installed or dynamically generated. The integrated recording allows for complete performance documentation. In addition, current process values can be integrated into the controlling workflow or workflow documentation. Another option is to link operational steps and instructions with workflows. Situational awareness with zenon includes the presentation of relevant process values in realtime as well as remote alarms. Background information and alarms are processed live and are context-based. They are intuitively and clearly visualized and distributed to the relevant persons. zenon allows access to dashboards as well as to reports over a browser, making sure authorized platform users can access relevant information remotely. As an option, remote operational tasks are also possible. 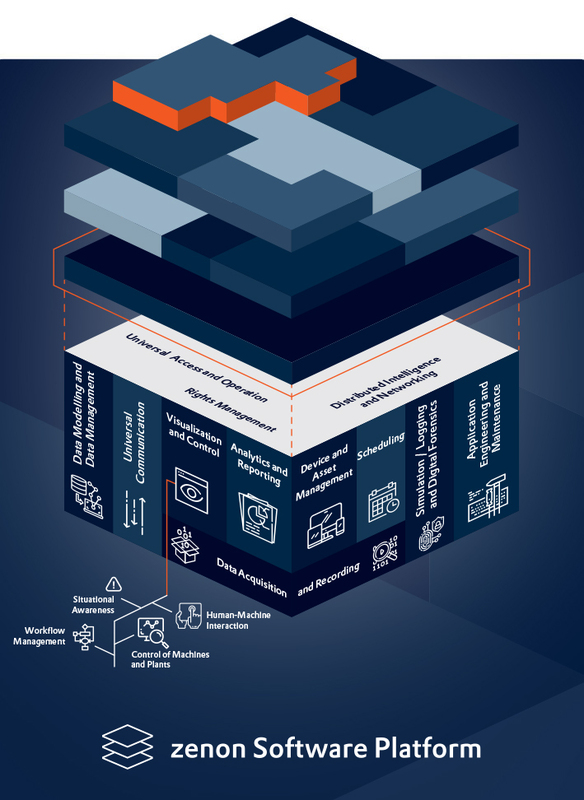 The zenon software platform allows extensive and granular allocation and administration of rights, differentiating between data access and operational rights. The rights system regulates interactions between users as well as third-party systems accessing via API. zenon’s open interfaces enable communication between machines and plant, as well as the seamless integration of shop floor and business operations. Open standards such as OPC UA and standardized interfaces (e.g. with ERP) facilitate implementation. In this way, zenon promotes the IT/OT convergence. zenon facilitates the appropriate distribution of local and centralized intelligent units. These units can be networked easily and securely. Complex overall architectures thus stay scalable and simple to maintain. zenon enables you to manage physical plants, which are mapped and integrated including their meta data. Furthermore, by enrichment with process data, a digital twin can be displayed. zenon’s asset management promotes efficient maintenance and supports the plant’s lifecycle management. zenon allows for control and documentation based on shift information. In addition, shift data is used as meta information to calculate key figures and reports. Shift data can also actively be used to control plants and facility infrastructure. zenon can compile and visualize historical data into reports and trend graphics. Reports can be manually retrieved or automatically created and distributed. In order to analyze historical process states, zenon has a "record and play back" functionality. To turn data into information, zenon uses various analytical components. Capabilities extend from simple calculations, such as key figures, to complex analysis for statistical process control. Information can be compiled in realtime or based on historical data. There is also an option for forecasting. zenon’s simulation capability lets you test projects under real-life conditions during their creation. It also saves time when preparing a launch or commission. In addition, simulation is used for training purposes as well as for the analysis and maintenance of plant components. If required, zenon logs itself and the state of external components such as network infrastructure. Extensive analytic tools allow for efficient optimization and fault detection. With the HTML5 technology in zenon, you enhance the possibilities for mobile access to important process data and information. If existing trends or lists are no longer helpful for the analysis of errors, the zenon Process Recorder can help and offers an even more precise analysis. The Smart Checklist replaces paper lists in production and simplifies and optimizes testing processes. Ergonomics in engineering [1/5] - Ergonomics in zenon starts with the continuous development environment of the zenon Product Family. Ergonomics in engineering [2/5] - Ergonomics in zenon also means that complex functionalities are available "out of the box". Without programming. Ergonomics in engineering [3/5] - zenon easily integrates into any machine - irrespective of how old or from which manufacturer it may come. Ergonomics in engineering [4/5] - Work efficiently and safely. The ergonomic solution is: Object orientation in zenon. Ergonomics in engineering [5/5] - Are you working with methods such as Lean Management, Six Sigma or TPM? zenon optimally supports you. Ergonomics for the user [1/4] - Operators of machines and equipment benefit from individually adaptable, ergonomic applications. Ergonomics for the user [2/4] - Short training times thanks to intuitive operation, optimum reaction times and the highest possible level of security. Ergonomics for the user [3/4] - Ergonomic operation of machines and equipment adapts flexibly to the requirements of the respective user. Ergonomics for the user [4/4] - Ergonomic operation also means being able to react quickly and correctly. Being optimally informed is the basis. zenon provides comprehensive protection from unwanted data loss and from unauthorized access. The powerful and flexible IEC 61131-3 programming system makes the configuration of projects quicker, more reliable, better and more efficient. Reach new level in usability and security of machine and plant control with Multi-Touch in HMI/SCADA. Ergonomics in the zenon network [1/4] - Optimal networking provides a clear overview, efficiency and speed. Ergonomics in the zenon network [2/4] - Bring information from distributed facilities to a central control room. Ergonomics in the zenon network [3/4] - Full data security, maximum availability without downtimes and no loss of data is guaranteed. Ergonomics in the zenon network [4/4] - zenon Webserver brings projects to the internet and intranets in their exact form. Ensuring high productivity and saving resources also requires errors and problems to be identified quickly and consistently. You always have an accurately archived and prepared data collection process and therefore a solid basis for competent and quick decisions. React quickly and appropriately thanks to the Industrial Performance Analyzer which creates a quick overview of your alarm messages. Accurate plant data collection is the basis for a successful operation management. Only this way, corporate strategies can succeed. Plant data collection: Valid, consistent and complete data for successful optimization of production. From HMI to SCADA and reporting: The importance of a comprehensive plant data collection. The PFS controls equipment and production processes precisely. For equipment with heavy consumption, considerable savings can be achieved. For the control of complex facilities or production processes - for this zenon offers the capability to manage recipes. By reacting to messages and alarms quickly you can avoid expensive downtime and ensure that the effectiveness of equipment remains high. The zenon Load Management uses sophisticated energy trend calculations to optimize energy consumption. You can avoid load peaks effectively and reduce costs this way. The SAP-certified zenon interface makes simple, secure and rapid connection to your process level possible with the ERP system SAP ERP. zenon consistently meets the criteria of FDA 21 CFR Part 11 throughout all its modules. You can save up to 90% in validation costs for new projects. If you have worked with WinCC up until now, you will be thrilled by this converter. Easily convert your existing WinCC projects to zenon projects. Use clever reports, identify hidden potential and advance your production. Get correct and concise reports you can rely on with zenon Analyzer, the Dynamic Production Reporting tool. Get the complete overview without delay. Combine real time data and historical data in your reports. With zenon Analyzer you can elevate profitability and realize optimum Return on Investment and low Total Cost of Ownership. zenon is designed to run on common industrial clients and operating systems. Using industry-leading database systems, zenon securely stores and evaluates data and parameters. For visualization, zenon uses web technologies such as HTML5 to enable access to dashboards and reports via a web browser. This allows access for control and monitoring from any location, independent of the underlying communication technology. An increasing number of other peripheral functions is also independent of hardware and operating systems. zenon is largely implemented by experienced system integrators that are trained, qualified and kept up to date as members of the COPA-DATA Partner Community. Customer-specific projects are created in the engineering environment, which integrates seamlessly with the runtime system. Project creation is supported by numerous automated functions and is usually completed simply by setting parameters. Engineering with zenon therefore does not require any in-depth software skills. Users have the option of integrating program code in a variety of languages and from various sources, such as mathematical and simulation software. zenon automation projects do more than just connect all common industrial control systems. The integrated IEC 61131-3 soft PLC can seamlessly integrate projects with PLCs based on uniform data and without interfaces. Using a WinCC-to-zenon converter, project engineers can enhance the efficiency of existing equipment and equip it with zenon’s expanded options by converting legacy software projects. zenon fulfills all criteria of FDA 21 Part 11, enabling the greatest possible flexibility within legal regulations. Using templates and a wide range of wizards, development logging, and project versioning, as well as automatic document drafting, zenon simplifies project validation for regulated industries such as Food & Beverage and Pharmaceutical. Using integrated simulation tools, zenon enables project creators to test projects under real-life conditions during the creation process, without the presence of hardware. Direct simulation with the real PLC code under real-time conditions in the integrated IEC 61131-3 environment improves security and speeds up commissioning. zenon is highly scalable. It facilitates designing projects of almost any size, from an individual machine to an entire company including all systems. zenon's object-oriented design methods ensures resource-efficient projects. In addition, different projects can sync up very easily, both horizontally and vertically, with or without an overall higher-level project. As a result, users can easily create interdisciplinary solutions, such as the automation of both discrete and process-oriented production or energy and building technology. zenon has extensive options for the ergonomic integration and activation of various network infrastructures as well as powerful multi-project administration. zenon’s comprehensive list of open interfaces and native drivers makes the integration of field devices and control systems easy. This facilitates comprehensive communication between machines and facilities and the seamless integration of shop-floor and business level. 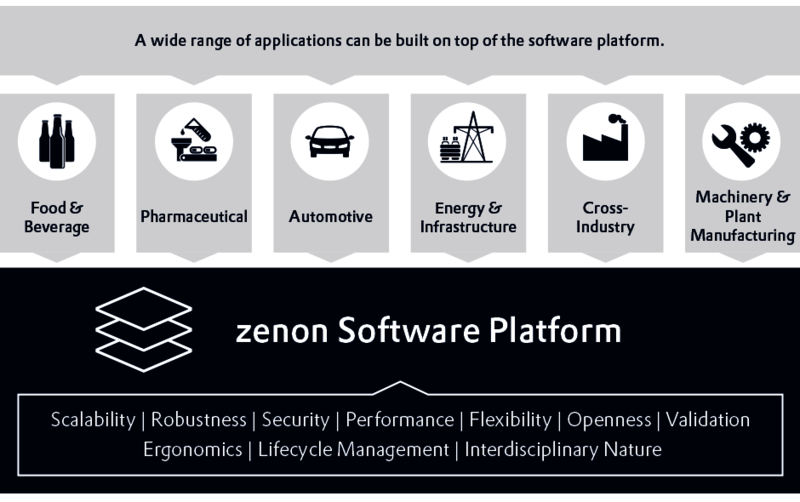 zenon supports open standards, such as OPC UA or MQTT, as well as standardized interfaces, such as those with ERP systems like SAP. This streamlines integration with the value creation chain and supports IT and OT convergence. The zenon Web Server helps to load projects on the intranet and Internet without prior adaptation. A web engine serves as a universal data transport mechanism from and to external systems. As data volumes continue to grow, zenon optimizes hardware and system resources thanks to its intelligent handling of information. This ensures high performance while minimizing hardware costs. zenon provides protection against data loss and unauthorized access with a comprehensive package of start-to-finish security features; from heavy encryption to authentication, file signature, interfaces with security certification, and user administration tailored to meet the requirements of the FDA. As a result, zenon can be integrated into existing security concepts without additional effort. zenon supports its users as operators and decision makers by displaying even complex systems and processes in an easily understandable way, supporting well-founded decisions with visualized data and processes, and allowing direct intervention. With zenon, operators can control and monitor equipment in their preferred languages and measuring units. This allows exporting machinery and plant manufacturers to create projects for worldwide use with a single, universal project. Furthermore, with the zenon Chameleon Technology, the ergonomic machine and system control adapts flexibly to the individual requirements of individual operators. zenon’s wide range of graphical options provides superior usability in systems operation. These include operation via multi-touch gestures, animated process images, and a “world map” as a navigation aid for extensive equipment and entire plants. zenon provides tools for easy and secure control of complex equipment and production processes with little need for direct intervention. As a plant calendar, the zenon Production & Facility Scheduler controls systems and production processes based on date, time, event and production status. Recipe management makes it easy to edit and save any number of parameter sets, and the Recipe Group Manager simplifies the management of complex recipe collections. With zenon, control and documentation can be based on shift information. That data can subsequently be used in the calculation of key performance indicators and reports. A workflow engine integrated with the software platform guides operators along defined workflows. The integrated recording documents process execution without interruptions. From the HMI through to the management level, zenon ensures consistent collection, evaluation and presentation of data. With functions such as Report Generator, Report Viewer, Archive Revision, Extended Trend Monitor and extended analytical functions, users can enjoy a quick and clear view of even the most complex correlations. The analytical capabilities of zenon range from simple key performance indicator calculations through complex analyses for statistical or predictive process control based on historical and/or real-time data. This supports users – from machine operators to top management – with all necessary information to make quick and sound decisions accordingly. Across systems and facilities, zenon provides a wide range of options for modeling and contextualizing data and for defining and using metadata, such as batches, shifts, alarm/event classes and causes of error. zenon’s alarm function and Chronological Event List provide all the necessary tools for detecting errors and their causes and responding consistently. This is also fully compatible with standards such as FDA 21 CFR Part 11. The zenon Industrial Performance Analyzer provides a quick overview of all alarm messages. It supports the statistical evaluation of alarm data and efficiently visualizes the data. Despite the location, operating personnel and decision makers receive alarm messages or system notifications through zenon Message Control. They can respond to these using the Notifier App. The Smart Checklist replaces paper lists, helping to reduce work effort and errors and simplifying storage, data management and testing processes. With zenon, equipment can be mapped and integrated along with associated metadata for administration. Likewise, a digital twin can be mapped using process data. Asset Management in zenon facilitates efficient maintenance and provides support throughout the lifecycle of equipment. In operation, zenon provides the utmost operational security and system availability due to its robust platform as well as its resource saving data and programming structure. The software platform's network technology features seamless redundancy and circular redundancy, enabling maximum system availability with full data security and without downtime. Maintenance, troubleshooting and the creation of individualized applications can be completed in the development environment simply by setting parameters. The zenon Diagnosis Server and the zenon Process Recorder enable traceable post-event fault and malfunctions analyses. New or modified functions are reloaded by Hot Reload during operation - with no need to restart. Even though zenon is continuously enhanced and further developed, compatibility will always remain a priority. This means the platform can be flexibly adapted to modified business processes and maintained in a simple way throughout the lifecycle of the equipment. With its annual release cycles, zenon offers new functionality on an ongoing basis. Find out more about the recent highlights. Know today, which part might be broken tomorrow? Forward thinking maintenance makes this possible. More efficient production with predictive maintenance. Customized HMIs offer ergonomics for machine operators in smart factories. Implement an Energy Data Management System in accordance with ISO 50001 with the zenon Software Platform.